100 Days in a row…13 times!!! 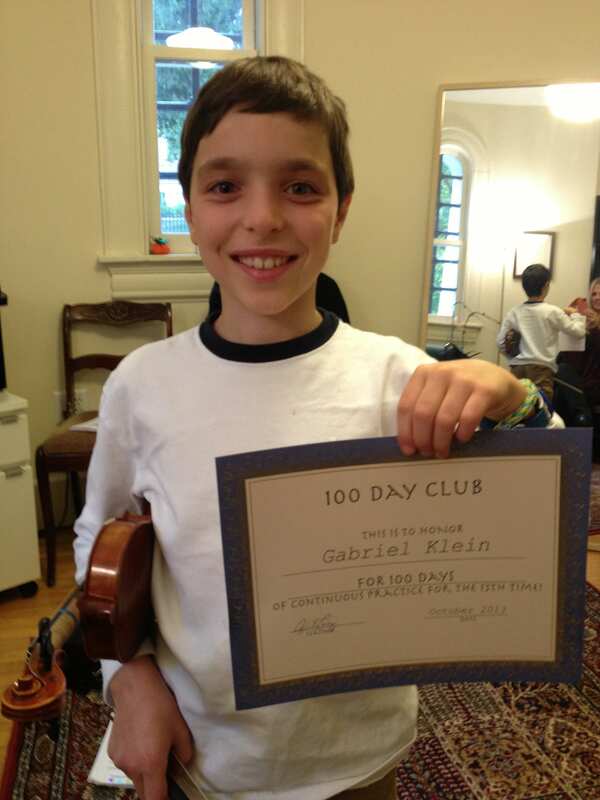 One of my students, Gabriel Klein, has practiced a 100 days in a row…again…for the 13th time! I asked his mom to write about their practicing experience. Last week Gabriel, now 8.5 years old received his 13th 100 Days Certificate! You may wonder how we do this? 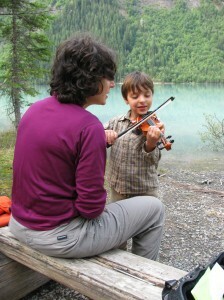 You may think that we are “Dragon Parents”, but honestly, Gabriel is the one who is in charge…he owns it and this is why we seldom hear,” I don’t want to practice!” If we do hear those famous words that parents dislike, we simply say, “OK Gabriel we can start back to zero again the next time you want to practice”. He never chooses to go back! When he was younger we used a grid to mark the days practiced and it was easy for him to see how long he had to go to accomplish his goal of 100 days. Now we simply mark it on a calendar so he can see which month we will celebrate 100 days. Once he completes a 100 day cycle, then, besides celebrating with a toy, game or family outing, he continues to feel empowered because he decides when the next 100 Day Cycle will begin. We are surprised to find out that each time, he will take a day or two off from practicing then practice a day, then take another day off for about 5 days. Then he is eager to mark the calendar (or my iphone!) to start the next 100 day cycle. Once he begins he knows that, “Not practicing is not an option”. You also may ask, “What are these practices like”. We practice every day once we are in the 100 cycle from 15 min to one hour depending on time available. Sometimes we play games to make it creative (much more when he was younger), and sometimes we just run through our checklist. He is a “checklist kid”, so this really works well for him and it helps him to know what is expected and when we will be finished. By the way, on the day of a lesson, concert, ensemble class etc., he still knows that he needs to practice if he wants that day to count. You also may ask, what about vacations, or if Gabriel is sick? If he is sick then listening to his pieces or other composers, count. 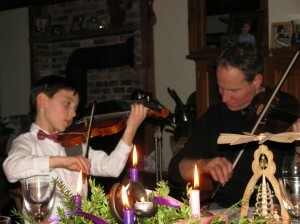 When he was younger, doing three bow holds or clapping a rhythm would also count. On vacations, the violin comes! 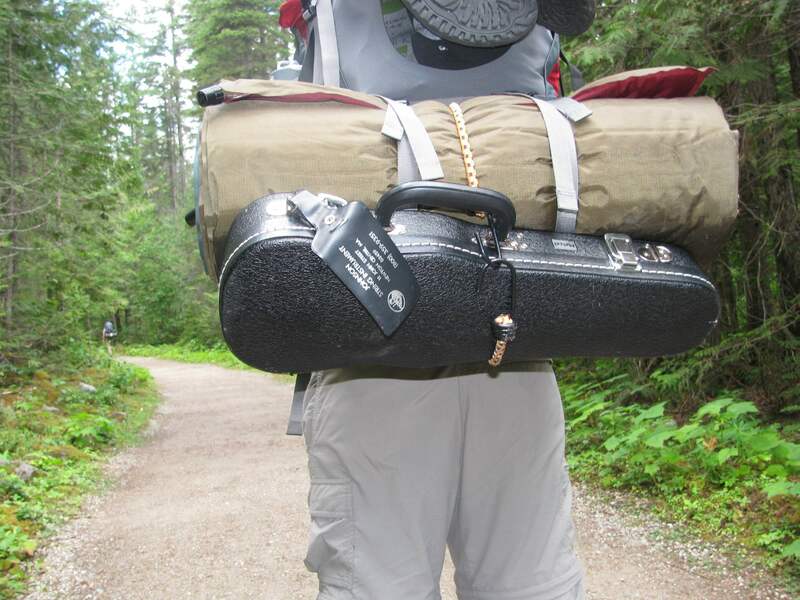 We love to camp and backpack and we have pictures of the violin strapped to my pack while backpacking! Or, practicing by our campsite by a beautiful lake. This summer on a long car ride to Canada Gabriel actually practiced in the car! His bow arm kept hitting the cooler, so we had to make some adjustments to the backseat paraphernalia! Now after 4 years of 100days of practicing, Gabriel just sees this as part of his life, (Like brushing his teeth), and there is seldom a complaint about whether he will practice or not on a given day….it’s just the way it is in our family! Happy 100 days to you!